Riding out of Tijuana was an intimidating experience. My host Elvis gave me lots of advice ending with trust the army but not the police and pointed me in the right direction, through the rough and tumble suburbs. The road out of town was a 60 mph highway absent of shoulder to hide in rising for a good few miles through the poorer part of the city. Drivers were as courteous as possible but riding here will take a lot more focus. Cheery thumbs up from folk on the street spurred me on as I’d been accustomed to. Ignoring the no biking signs I tried to take the toll road for the first portion south but my best Spanish didn’t charm the gun toting member of the military, “Es demasiado dangerous por me en la otro Calle, Es possible para mi por favour”? though we did share a few laughs, probably not at the same thing. I turned my bike down the gravel banking and headed back to the treacherous main road for the first stretch of the Baja peninsula. On a map the peninsula, consisting of mostly desert didn’t look like much of a challenge but at around 1000 miles is the longest peninsula in the world. A rough plan of three weeks with a few days off for Christmas and New Years was my target. 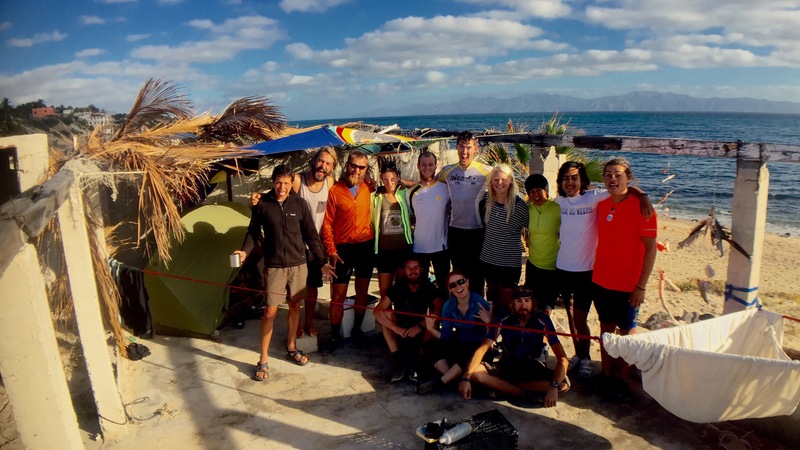 I camped outside an empty hostel which didn’t seem to be much of a working business as a surf hostel or as the residential rehab it was in the process of being remodelled as. Still, it was nice to have a safe place to camp, I chatted all morning with the owner, a British chap and Brentford fan, of football and socialism before taking off to the hills through wine country onto Ensenada a beautiful little town. The immediately apparent difference from the state’s was the street life. I ate aguachiles, a raw shrimp cocktail in the local square. It was a Sunday and locals were dancing and chatting away, the culture change from just 80 miles up the road was incredible. I asked around at a taco stand for a place to stay when Lupita pulled up and Told me to follow her. I tried to keep my food down me as she cut through traffic and led me to a cabin in her yard. Lupita daughter was hosting a party so I spent the evening haunting up their piñata and being equally charmed and mocked by a house full of teenage girls. The following night I camped under a restaurants awnings, with much encouragement from the owners, Mexico was being incredibly welcoming. The landscaped turned more orange and cacti as big as houses started to pop up from the barren and scorched landscape. I was enjoying riding alone in the Baja after my initial apprehension, full of confidence in using my utterly appalling pigeon Spanish. I found Austrian Mike sat at the roadside munching on pausley looking cheese sandwiches. He was shirtless, possibly the skinniest man I have ever seen and I clumsily started our interaction by enquiring “are you Ill?” He responded in a very matter of fact way “no it’s genetic”. He was riding a mountain bike with a trailer attached adorned with a flag sporting the name bob. A visual indication of the battle with the wind Baja was presenting us with. Mike had been skimmed by a truck traveling at 80 kilometres per hour the previous day and was figuratively licking his wounds. His kit had been torn up and his bike damaged, fortunately the driver had stopped, took him to the doctors and paid for his repairs but understandably his confidence had been knocked. We both wanted to make good time, he to get to la Paz for New Years and me for a Christmas Day hotel courtesy of my cycling compadre from back home Doug. 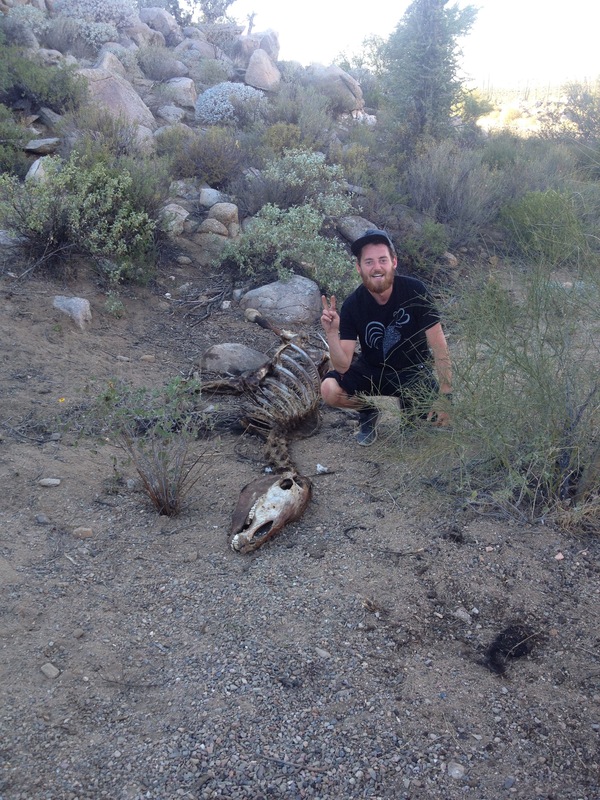 We battled the Baja winds and baren desert together, finding rancho el sacrificio to camp outside one night amongst their animals and the skulls of what was presumably being boiled up in their kitchen. These roadside ranches without electricity or running water were scattered every 40 miles or so and provided much needed Coke refuelling points an essential for Mike who lived off three litres of Coke per day, insisting food didn’t work for him. The wind picked up in the afternoon so we made 5am starts and camped wild in the desert at night. The scenery of the Baja was something else, undulating landscapes with crazy rock formations and an incredible array of different cacti. We pushed each other and made really good time, stopping for banana and maple syrup burritos and cactus climbing attempts. 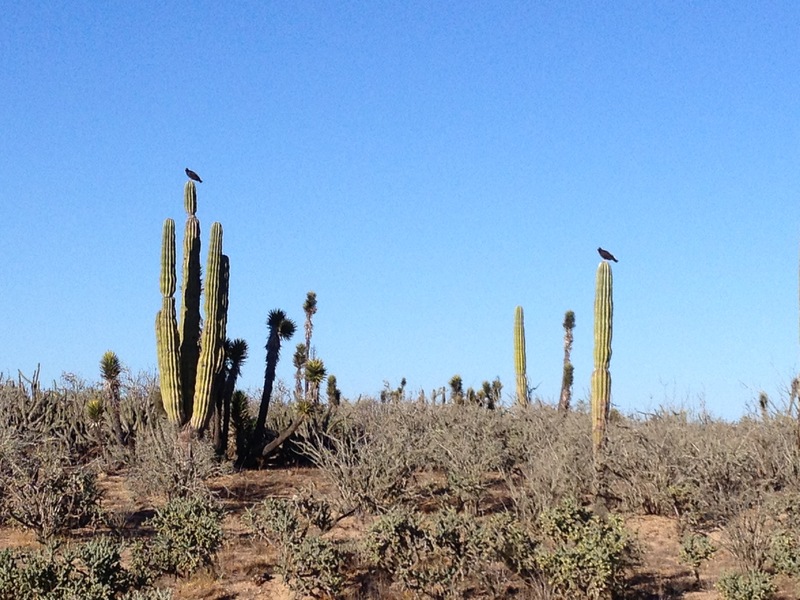 Though beautiful the desert provided constant reminders of mortality. The carcasses of coyotes, horses, dogs and cattle were in various stages of decay, from complete skeletons to still warm fodder for the hordes of vultures. The remains of car wrecks would be left for years. Squashed snakes Immortalised in the Tarmac. Despite the harsh environment there was something very calming about days and nights spent in the desert, almost freezing but with incredible views of the stars. I’ve never been one for horses but on a few occasions we come come across horses, standing as still, proud, yet humble as can be by the roadside. There gaze into the distance undistracted as we passed. There was definitely something captivating about the desert horses, I had no idea who’s they were or why they waited so patiently but I found them incredibly beautiful. Too much time alone I think! 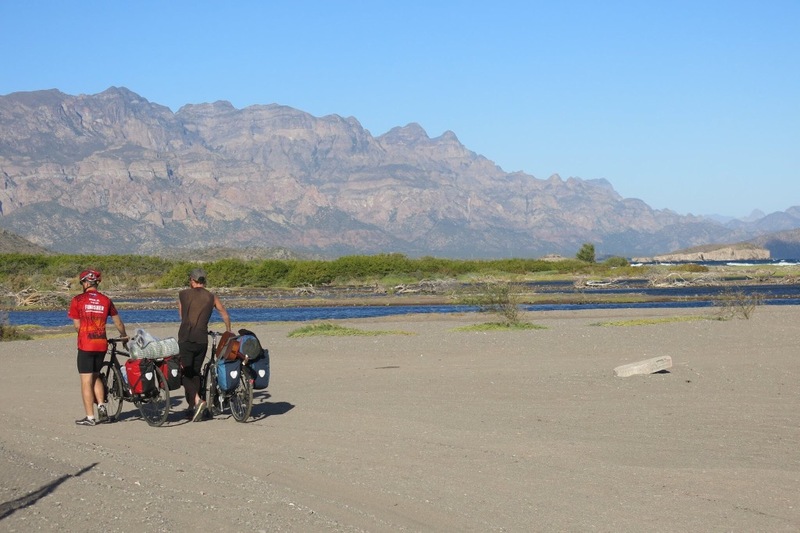 After a good few days of 160 km a day me and mike rode into southern Baja. We parted ways as Mike was suffering with a machaca belly ache in the tropical looking town of San Ignacio, scheduling a rendezvous for New Years. The day time temperature was rising, my clothes and cap stained white from the salt of my sweat. 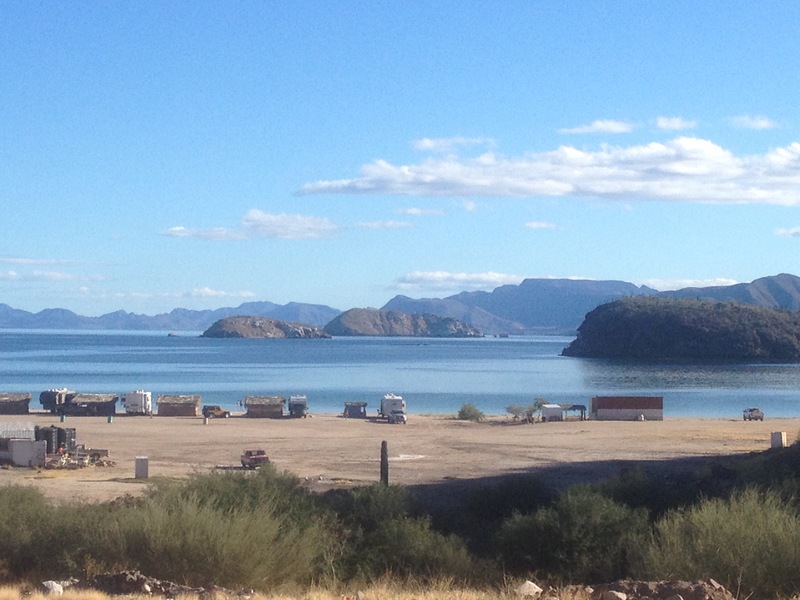 I ran out of water as I headed up into the mountains and rode a painful 2 hours before rolling down and catching my first view of the sea of Cortez. It’s still, dark blue waters were in stark contrast to the Pacific that had been my companion for so long. I opened my gullet and downed two litres before bumping along broken streets to the scruffy looking working town of Santa Rosalia. The water front was full of old industry and the town had a very authentic feel to it. 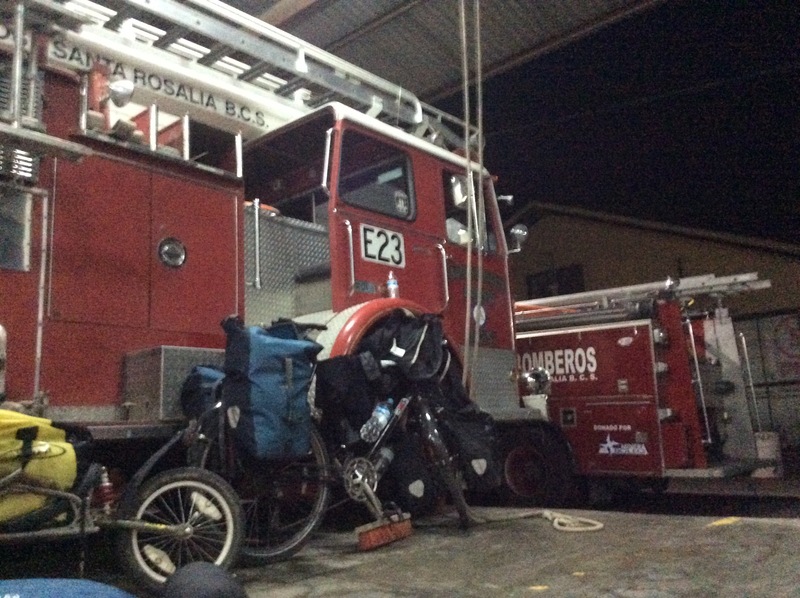 The bomberos (firefighters) let me camp for the night in the fire-station. They were winding down after an entire block of the city burnt down the previous night after an accident with a deep fat fryer. My headache from the days dehydration wasn’t helped by the diesel smell of the fire station but I enjoyed listening to the bomberos chat whilst sitting on the old fire trucks as the Main Square of the town buzzed outside, gearing up for Christmas. Nearing Loreto a Christmas target I spent the next night on the Bahia de conception camping on the beach in an incredibly beautiful turquoise bay that barley rippled, the only sound being the leaping shoals of fish. Setting up my tent In front of a mellow beach bar I found Safia, feet up, reading in front of the sunset. Three days into my trip I had heard talk from some truckers of a French Algerian woman who had left Prudhoe Bay the day after myself, also heading to Argentina. Six months later, on Christmas Eve our paths incredibly crossed. We recounted our trips and talked of the other folk on bikes and hosts we had shared experiences of. Rumours and sitings as well the short weather window had us recon there were maybe 10 or so people attempting the entire route down the pan American highway. We rode into Loreto for Christmas feeling a great sense of shared experience even though our trips comprised of different stories. There had been a few moment of the past six months when I wondered exactly what I was trying to do, there was something quietly comforting about meeting Safia and the feeling of camaraderie. A swanky hotel courtesy of Doug with a room big enough to dance in made a good spot to touch base with home for Christmas and Ana the gracious hotel owner kindly plied me with free Tecate. Loretto was a charming, smart coastal town fronted with a deep beach and palmed tree lined malecon. The town was effectively closed down for Christmas but the Mexicans were having big parties on every corner one of which I was kindly invited to. After a solid ten hours on Skype I was ready to leave on Boxing Day where I met three young Mexican students, Esteban, Yoakim and Paolo. They had bought bikes in San Diego and were riding them home to Guadalajara. We rode tightly packed for four days towards La Paz. Baja provided all sorts places to sleep for free. A night on the beach of a wildlife reserve, a church took us in and tentless nights under the stars in the desert and a roadside restaurants terrace. I grew very fond of the young Mexicans, their energy and laughter. They shared all their tasks, cooked together impressively well for twenty year olds. I enjoyed their excitable Spanish conversations and even managed to pick apart parts of their stargazing wanderings. 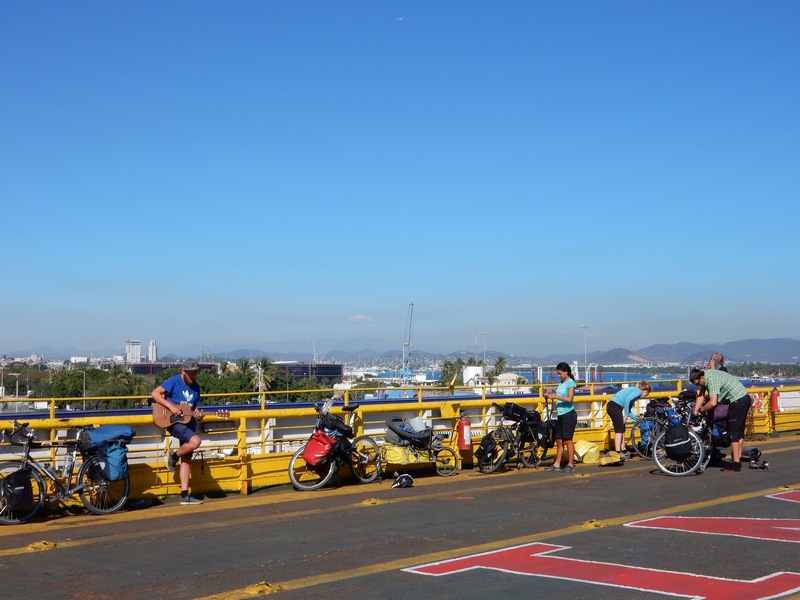 The downside of their company was that they cycled hard and cycled fast, my tired limbs were falling apart as we hit La Paz. Hotel California was a meeting point for lots of bikers we had all met on the road and we headed in convoy 50 km over the hill for New Year’s Eve in the kite surfing resort of La Ventana. Safia’s friend Antoine a French Canadian had made a home from the abandoned wreck of a house on the beach where fifteen of us made camp. Fresh fish were cooked and dodgy Mexican fireworks followed by a gringo party and too much tequila made a fun New Year’s Eve celebration. More fish were caught and cooked on a New Year’s Day which was spent swimming around, playing cards and mulling around by the ocean. We retuned to LA Paz still worse for wear on the second of January. After a two hour climb up an endlessly straight 20 kilometre hill in the blistering heat Safia announced her 10000th km of the trip. 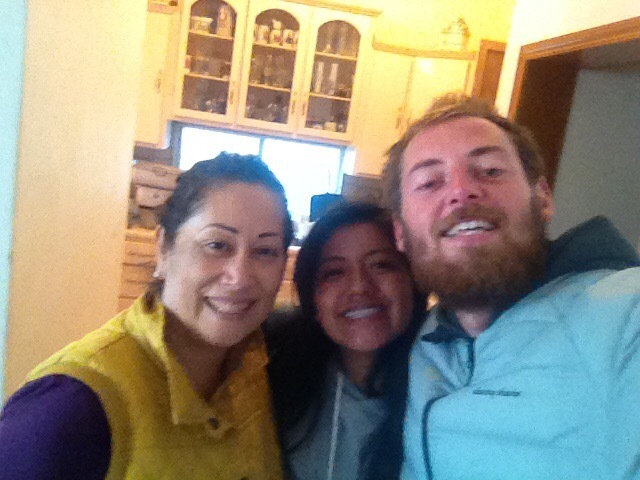 Me Mike and Safia celebrated with Nutella tortillas and cookies before rolling into la Paz. 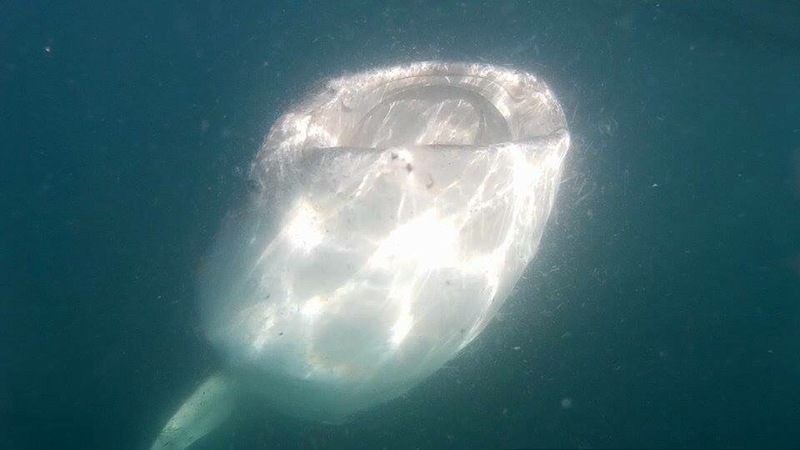 A day swimming with the whale sharks in the bay of la Paz was an incredible introduction to 2016 before half of the convoy boarded the ferry for the 22 hour crossing to Sinaloa. Margaritas were served and Mariachi music blasted from the deck of the dilapidated ferry into the star-filled night. A sense of excitement was brewing as we chatted around maps of Mexico spread over the deck. Plotting respective routes and asking the Mexicans of their recommendations. My rough plan looked like a mess, trying to explore as much of the coast whist avoiding the dangers of cartel violence in the states of Michoacan and Guerrero. Two Australians had been murdered in the state of Sinaloa, where we would disembark the ferry, in the previous month so it was good to get clued up. Despite the scare stories I was ready to venture beyond the tourist infrastructure and expat communities of southern Baja and found the Mexicans I head met so far incredibly warm, welcoming and relaxed and whether rose tinted or not, actually felt safer here than in California.